Written by Kim Skov-Nielsen, a hugely experienced round-the-world yachtsman and active marine surveyor, this book provides a concise, informative and clearly-written outline of what an owner or operator must take into consideration when looking after the mast, rigging and sails. It is also a highly useful guide to what a surveyor should be looking at when surveying a rig. 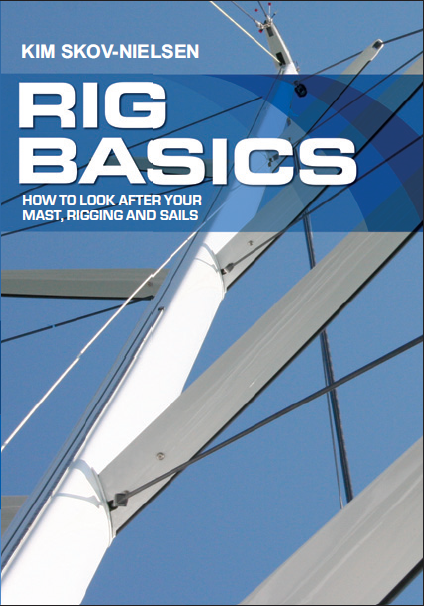 "Just out is Kim Skov-Nielsen's book called 'Rig Basics'. I was so taken with this slim volume that I agreed to write a foreword for it. I really believe that no skipper should put to sea without it. It covers every aspect of rig maintenance and we'll all be a lot safer and happier with it on board." "Kim trained with us on America's Cup Class yachts. He has raced and sailed professionally worldwide, and his experience enables him to explain rig issues clearly. This book is a must read for every owner and crew." "As we say in the Olympics, 'safety is no accident!'. This book provides a complete and simple guide to getting you back to the dock safely with your mast in one piece." "Kim's provenance as a sailor and boat surveyor is well known and during his 150,000 blue water sailing miles and Americas Cup racing he required an efficient, serviceable and importantly safe and reliable rig to deliver him to where he needed to be. Hence Kim's qualification to write on this subject is beyond reproach. I was lucky enough to attend an IIMS Rigs and Rigging workshop run by Kim where his enthusiastic, no nonsense approach was very evident and this comes across in the book very clearly. And the book attracted an introduction by Tom Cunliffe no less. For a sailing boat the rig is fundamentally what makes it function and Kim correctly reminds us and describes the wear, tear, load cycles and chafe that takes place every moment the rig is up and without a thorough knowledge of the set up and attention to diligent inspection and maintenance regimes, it will fail at some stage. The book has separate and very clear sections on each of the crucial parts of the rig as well as chapters on going aloft safely, setting up and tuning and helpful maintenance schedules. There is also a useful bibliography and glossary for those who need help with some of the technicalities. Excellent colour photographs and line diagrams abound throughout the book clearly showing important detail and the language used in the book assumes a reasonable working knowledge of the subject which is refreshing. The text also contains some humour - sail makers manning winches ensuring repeat orders on sail repairs - and anecdotes which always add life to technical prose. This is a 66 page, A5 size book, probably aimed more at surveyors, boat builders and serious yachtsmen to whom the correct condition and tune of the rig is particularly important. But as Tom Cunliffe sagely points out no skipper putting to sea should be without a copy; I have already ordered mine." "'Get to know your rig - don't just assume it is up there. Inspect it often. Work out a safe system and climb the rig often. Take your camera with you and take photos instead of notes. Keep a rig log. It is not good enough to inspect the rig from the deck with binoculars - someone has to climb up."